Please kindly read these terms and conditions carefully. On booking online or when making a reservation over the phone or by email, you are deemed to have read and accepted our Booking Terms and Conditions and are accepting the terms of these conditions on behalf of all persons in the party. Prices are subject to 10% tax and 5% service charge, quoted in Vietnamese Dong. Deposit payment can be settled by cash, bank wire transfer, credit card or PayPal. Deposits are generally 30% of the total cost, which is required as soon as the booking is confirmed. – all cruising is forbidden for both day and night. Upon arrival, guests can choose:1.2.1. Not to wait, and cancel their cruise altogether. 1.2.1.1. If guests decide to cancel the cruise before receiving final decision from the local authorities, Heritage Cruises will not offer any refund. 1.2.2. To wait until 3.00pm and enjoy lunch on board (if presence of people on the boats anchored in the marina is allowed by the Port Authority). 1.2.2.1. If the guests wait, enjoy lunch on board and at 3.00pm the cruise is cancelled, then only 35USD will be charged to cover the lunch. 1.2.2.2. If guests wait, enjoy lunch on board and at 3.00pm only a day cruise is allowed, then only 90 USD will be charged to cover the lunch and day cruise. 1.2.2.3. If guests wait, enjoy lunch on board and at 3.00pm overnight cruising is permitted, then only USD345 will be charged to cover the lunch, day cruise and overnight. The permit to cruise on the second day of the 2- or 3- night cruise is delivered by the Port Authority at 8.00am the day of cruising, under normal circumstances. If the cruising permit is denied at 8.00am, guests will go back to the harbor at 10.30am with guests checking out that day. They will have then the same possible scenarios and alternatives as in section 1 above. 2.2.2. In case guests decide to remain for lunch on board, when permitted, but cruising ends up being entirely denied on that day: cruise will be charged as 2 days/1 night +35USD to cover the lunch. 2.2.3. In case guests decide to remain for lunch on board, when permitted, and cruise a few hours during that day, when permitted, but overnight cruising ends up being denied: cruise will be charged as 2 days/1 night + 140USD to cover the lunch and day cruise. 2.2.4. No refund can be claimed when overnight cruising ends up being allowed and the guests spend the second night on board as well. 2.2.5. No refund can be claimed if guests decide to end their cruise at 10.30am on the second day without waiting for the final decision from the Port Authority. In case of bad weather conditions or risks of tropical storm on the day of departure (check-out), the Port Authority may order the ship to return to the marina earlier than planned. No refund can be claimed in this situation. 4.1. Guests using transportation not booked via Heritage Cruises shall contact their travel agent/ transportation supplier directly to make all necessary arrangements deriving from a cruise cancellation. 4.2. For guests using Heritage Cruises Transportation Services, Heritage Cruises will arrange transport back to Hanoi. 4.3. As Heritage Cruises shall not be held responsible for any cruise cancellation due to weather conditions, if transportation has been used, the cost of transportation cannot be refunded by Heritage Cruises. Even when cruising permits are delivered, bad weather conditions might force our Management, Captains and Crew to modify the schedule: change of routes, visits cancelled or modified, etc. By booking with Heritage Cruises, all guests agree that all programs are subject to change without prior notice. Heritage Cruises offers the opportunity to dine on a beach, in a cave or in a floating village. Guests booking these extra services should be aware that it might be necessary to cancel outside dining at the last minute in case of bad weather conditions and to replace it by dining in the ship’s dining room. Heritage Cruises cannot be held responsible for the cancellation of outside dining due to bad weather conditions and thus will not offer any refund. The Port Authority, Haiphong Province Authorities and other Officials may request, without prior notice, to inspect one or more of the fleet’s ships. Heritage Cruises shall not be held responsible for any delays, change of schedule, early check-out that could occur due to the Officials’ inspection, and will thus not offer any refund. 7.1. Permits can be denied due to thick fog: in this case, it is impossible for Heritage Cruises to know or predict this in advance. 7.2. Although for most tropical storms we usually have warnings and information 24 to 48 hours in advance, it is very often impossible to predict how powerful it will be when reaching the coast of Vietnam and sudden trajectory changes are also very common, hence the delay in obtaining, then communicating, information. 7.3. Very often Heritage Cruises receive from the Port Authority many contradictory pieces of information before the final decision at 3.00pm. Heritage Cruises will communicate to the passengers all information as given by the Port Authority and should not be held responsible for inconsistencies, last-minute changes, and contradictions. 7.4. In the case of risk of tropical storm at night, the weather might show no sign of danger upon the guests’ arrival and only change much later and quite suddenly. In case of tropical storm warning, it is usually forbidden to have people on board, even when the vessels are anchored in the harbor. Passengers using the services of a travel agent should then address their travel agent for refund. Heritage Cruises directly refunds the agent the amount paid by them. Final payment is due 30 days prior to departure date for FIT bookings and 60 days prior to departure date for GIT bookings.If reservations are made less than 60 days prior to the departure date for GIT bookings and less than 30 days prior to the departure date for FIT bookings, payment in full is required at the time of booking. If final payments are not received on time, Heritage Cruises may cancel the reservation and invoke the cancellation fee.Except as otherwise agreed by the Merchant, client payments shall be made in cash or by credit card. Credit card transactions do not incur bank charges.In cases where credit facilities have not been agreed with the client/agent, payment shall be made by swift or telegraphic transfer to the Merchant’s bank account. Any bank charges levied by the sending bank relating to transfers to the Merchant must be paid by the client/agent. No refunds or exchange can be made in respect of accommodation, meals, sightseeing tours, transport or any other services which are included in the tour price but not utilized by the guest. A voucher will be issued by Heritage Cruises after the booked trip is confirmed and payment is completed.A service voucher will be sent by email/fax to the passenger. Heritage Cruises accept no responsibility for any loss, injury, damage or delay due to natural disaster, political actions, weather or causes beyond its controlTravel insurance and medical precautions are essential. Your travel insurance must provide cover against personal accident, medical expenses, emergency repatriation and personal liability. We strongly recommend that you take out travel insurance at the time of booking. All confirmations are generally made by return fax or email within 2 working days. In case immediate confirmation is not possible, we will inform you of the booking status at the time of reservation. • Free of charge sharing cabin with two adults (maximum 1 child). • An additional charge of 35USD per extra bed, if required, in the cabin for 2-day/1-night program or 70USD per extra bed for 3-day/2-night program. Baby cot is free of charge. This extra service is subject to Heritage Cruises availability.If a child occupies a cabin on their own, the full adult rate is applied.Over 12 years old: will be charged same rate as adults. The client is requested to submit all passenger details at least 24 hours prior to check in (Full name, Date of birth, Gender, Nationality, Passport number, Vietnam visa expiry date, Contact number). Passengers are advised to bring their passport during the tour as representatives of the Cat Ba Port Authority can board to check at any time. Payments can be made by credit card, bank transfer or cash. We accept Visa Card, American Express, MasterCard. GROUP FROM 1 – 3 SUITE CABINS up to 14 days prior to check: No Cancellation Charge. Less than 14 days prior to check in: 100% of total cost. GROUP FROM 4 – 20 SUITE CABINS up to 30 days prior to check in: No Cancellation Charge. Less than 30 days prior to check in:100% of total cost. Final payment is due 30 days prior to departure date for FIT bookings and 60 days prior to departure date for GIT bookings. If reservations are made less than 60 days prior to the departure date for GIT bookings and less than 30 days prior to the departure date for FIT bookings, payment in full is required at the time of booking. 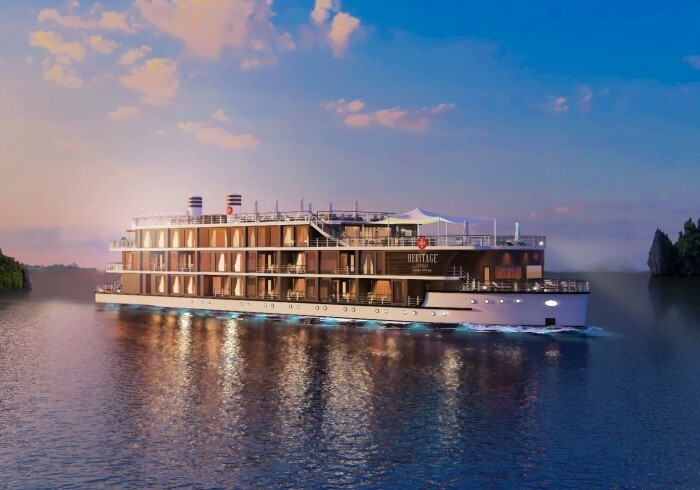 If final payments are not received on time, Heritage Cruises may cancel the reservation and invoke the cancellation fee.Except as otherwise agreed by the Merchant, client payments shall be made in cash or by credit card. Credit card transactions do not incur bank charges.In cases where credit facilities have not been agreed with the client/agent, payment shall be made by swift or telegraphic transfer to the Merchant’s bank account. Any bank charges levied by the sending bank relating to transfers to the Merchant must be paid by the client/agent.